We are using gravatar.com to get your image. "Your Gravatar is a Globally Recognized Avatar image that follows you from site to site appearing beside your name when you do things like comment or post on a blog. Avatars help identify your posts on blogs and web forums, so why not on any site?" To change your avatar log in to Gravatar.com and follow the on-screen instructions to change the Gravatar for . We can help you reset your password or your login using your the email address or the login linked to your account. Check your email! We've sent an email to you. Click the link in the email to reset your password. If you don't see the email, check other places it might be, like your junk, spam, social, or other folders. .
We really appreciate your feedback and donations. We're two developers and we're keeping our service free without ads. So if you like our apps or you're a rich guy :) please support us to cover our server costs to keep Kopy running and complete all the requested features and build other useful free & ad-free apps. We also accept any kind of help from UI, UX designers or developers. Thanks for using Kopy!! 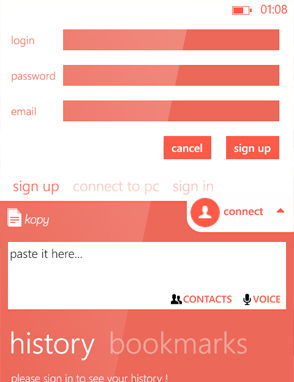 Kopy is now available on Windows phone 8, Windows 8 and Android. Our team is working to get you soon an iOS version. Scan the Qr code above with you phone to create a temporary session. 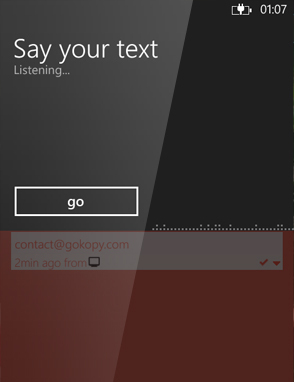 Creating a temporary session is similar to sign in with an account, while the session is active you can easily send and receive texts between your computer and your phone. and paste across your devices. Ads Create a free account to remove ads. 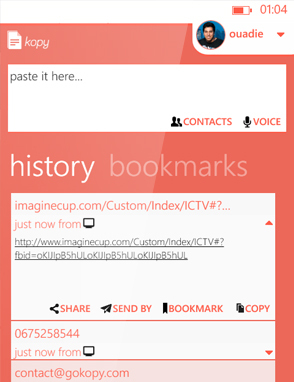 This block is reserved for bookmarks for registred users. Create an account now and remove ads, it's free! 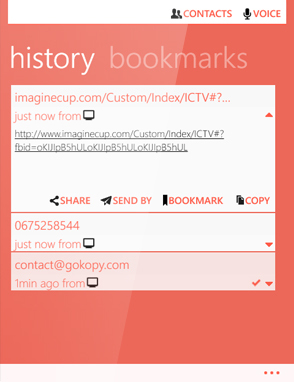 Sharing texts between all your devices is now easy with Kopy! 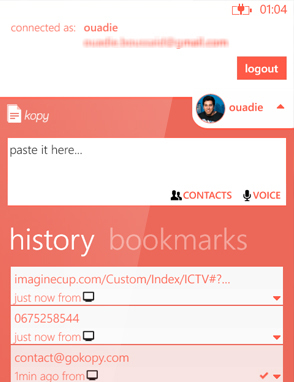 Kopy integrate fully with your browser to offer you the best experience ever. 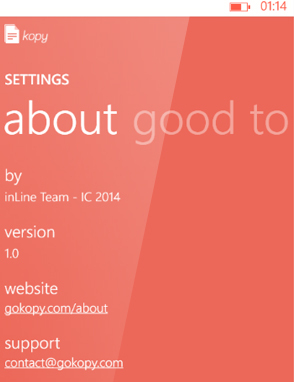 Download the extension to your favorite browser and start kopying snippet immediately. 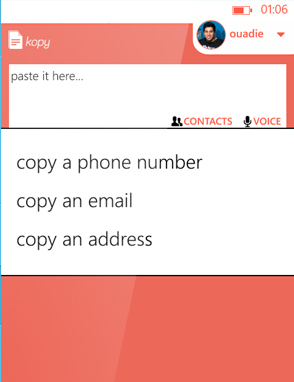 The term Kopy means copying from your computer directly to your phone! Voila that's it! 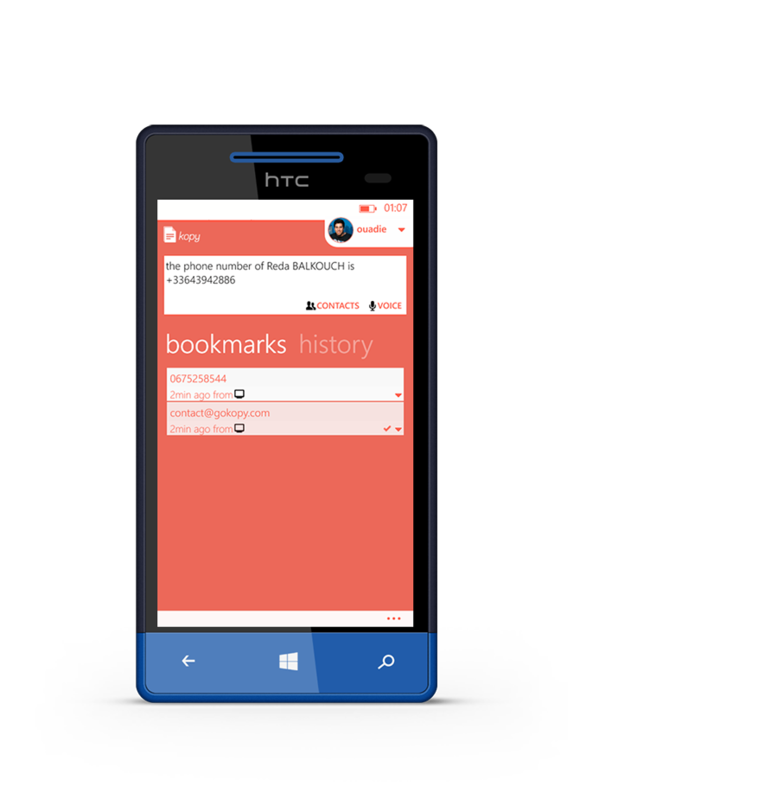 Usually users send emails to their own account, just to get the text or file they want on their phones! With Kopy it will be easy and fast! 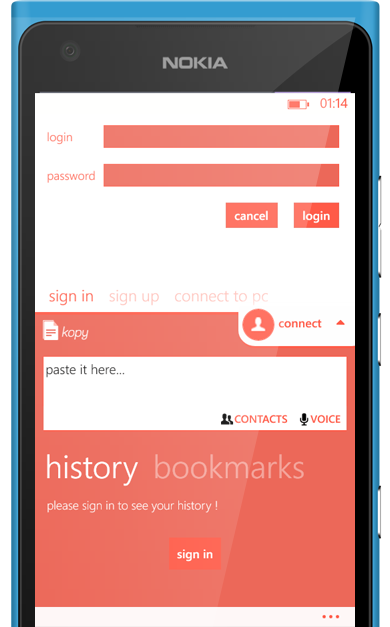 With our browser extension, you can continue browsing the internet on your phone! You don't need an account? you don't want to create an account? Use a temporary session by scanning the QR code above with your phone. Just scan the QR code on any computer, Kopy what you want, once your done, just logout from your phone or from the computer to end the session. Creating a temporary session is similar to sign in with an account, while the session is active you can easily send and receive files between your computer and your phone. Our application gives a ton of useful features to our users. 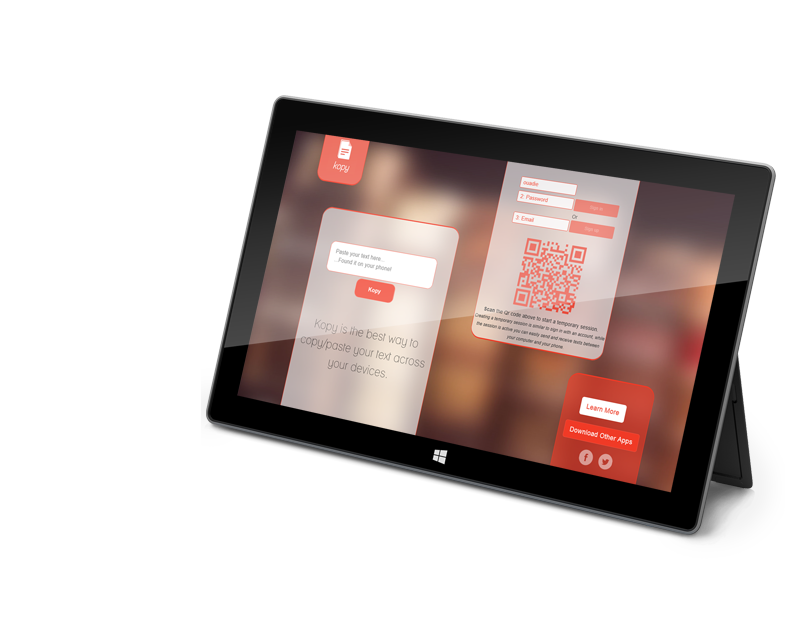 You want to get a file on your phone from your PC or your tablet? Just Kopy it! 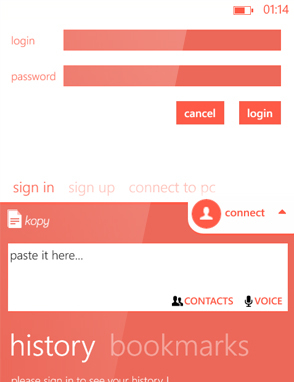 Kopy your text using only your voice, you can launch the application with voice command and say your text to send it to all your devices and then share your snippets to your favorite social network or send it by email or SMS. If you always use the same url or file, and you want to keep it. 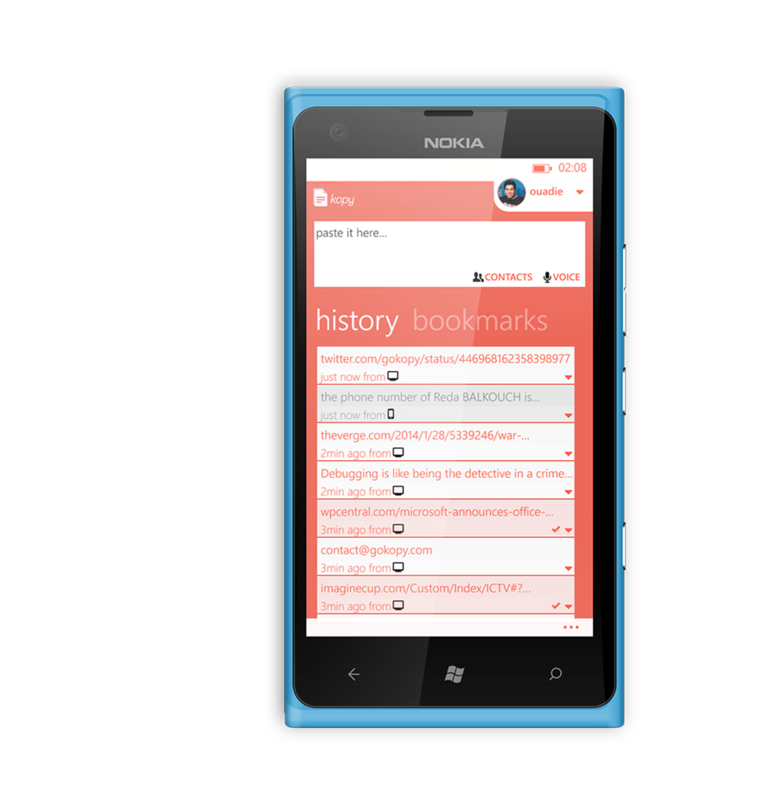 You can bookmark it from your history list to save it in your bookmarks You can shake your phone to refresh the two lists. 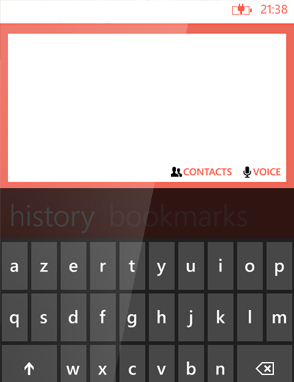 You want to Kopy a contact address, an email, or a phone number from your contact list? You can get it directly from our application to your computer fast and easy! 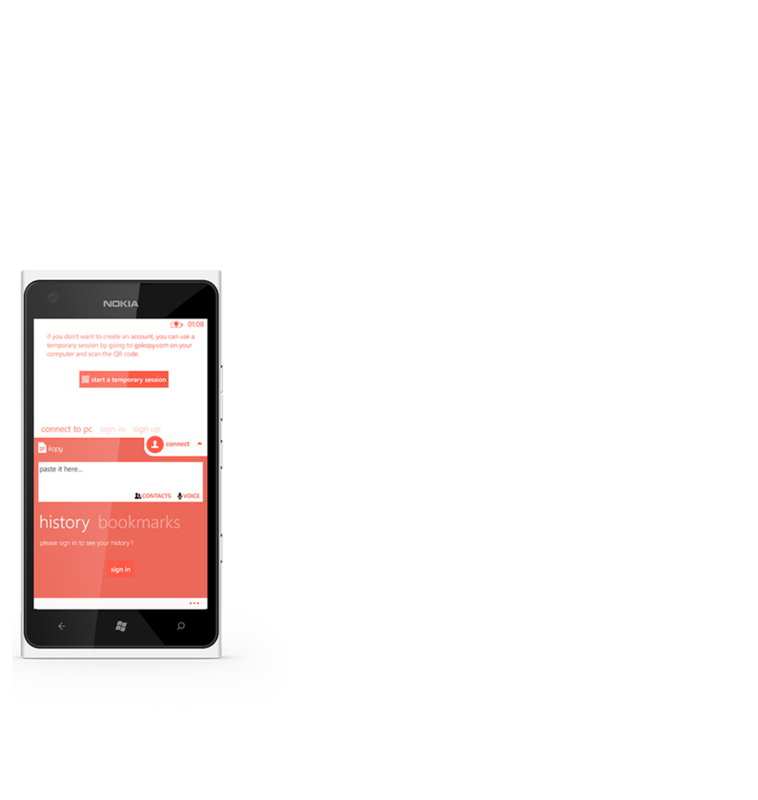 Here is some screenshots illustrating the idea of our application.